When Miss South Africa 2014 is announced at Sun City on 30 March she’ll be crowned with a brand-new glittering crown. When Miss South Africa 2014 is announced at Sun City on 30 March she’ll be crowned with a brand-new glittering masterpiece worthy of her prestigious title. Sun International, long-time licence holder of the Miss SA competition, has unveiled a magnificent, modern platinum crown especially created for the dazzling occasion by Jack Friedman Jewellers. The crown is synonymous with beauty pageants and the Miss South Africa organisers decided a new headpiece had to be created for the revamped Miss SA pageant. The team at Jack Friedman Jewellers wanted something that was both elegant and memorable and so decided to make the crown from platinum, one of the rarest elements in the earth’s crust. It is also a precious metal that’s synonymous with South Africa, which accounts for 80 per cent of the world’s production. 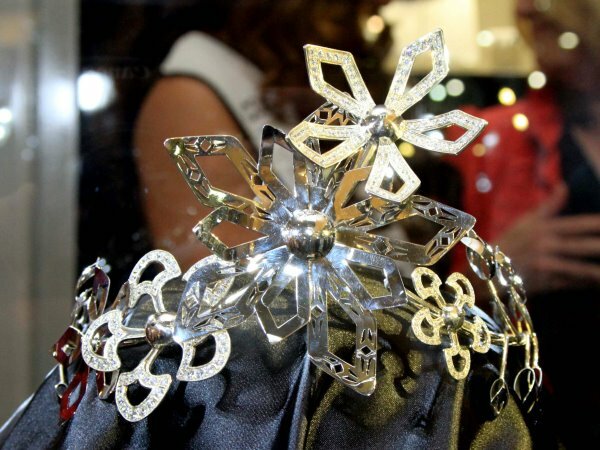 The precious metal in the Miss SA 2014 crown comes from Anglo American Platinum. Working with pageant designer and fashion guru Malcolm Kluk, the Jack Friedman team took inspiration from the natural beauty of indigenous South African flowers and traditional patterns to create the new crown. Simple and striking, it has been named Palesa, which is the Sotho word for flower. A close up of 'Palesa'. Vying for the title and the tiara are 12 Miss SA finalists from around the country. They are Abigail de Jager, Mpumalanga; Anzél Stofberg, Western Cape; Caylene Marais, Gauteng; Dipalesa Mbola, Free State; Jade Hubner, Western Cape; Julia Petersen, KwaZulu-Natal; Matlala Mokoko, Limpopo; Mishka Patel, Western Cape; Rolene Strauss, Free State; Tidimalo Sehlako; Gauteng; Tshegofatso Monggae, Gauteng and Ziphozakhe Zokufa, Eastern Cape. The Miss South Africa pageant, presented by Sun International and sponsored by Cell C, takes place at Sun City Superbowl on Sunday 30 March. It will be televised live on Mzansi Magic (DStv Channel 161) at 5.30 pm on 30 March.